Ten euros doesn't go very far at the fair today. Two rides, that's all it'll give you. I'm pretty shocked by that, but this is probably because I'm an old stick-in-the-mud bat who can remember when rides cost ten francs. Not just in my lifetime but in my lifetime in France, which is less. My youngest nagged me into going to the fair at the village next door, after a day spent at the Pont d'Issensac, a place he'd been constantly telling me he wanted to go for a week. He'd been taken there the previous weekend by his friend's mum and had such a fantastic time he wanted to go again. It's an impressive 12th century bridge, but it's not the history that so enthralled my youngest. Can you see the rock face on the other side? It's a favourite place for jumping into the river, and that was what my youngest wanted to do again. We had a picnic further down, where the river is shallower and there is a little barrage which concentrates the flow of the river into a narrow passage and some exciting current. 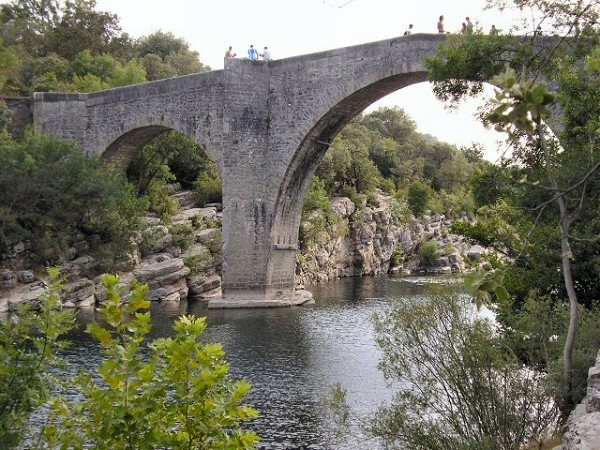 We then walked to the bridge and the rocks where a number of ado boys and younger boys were egging each other on to jump. They were showing a fine display of male courage and competition. My youngest was highly pleased with himself. My eldest had a great time too jumping off the highest bit of the rocks (about 5m). No one jumped off the bridge (which is forbidden) until a group of maghrebin lads appeared who immediately started doing just that. Luckily they did not add to the tally of 4 deaths and 6 serious injuries since 2004. Back home, I agreed to take my youngest and his little friend to the fair. My eldest was going to meet up with his buddies but he needed money so I made him stay for supper and drive in with us so I could get some cash (hehe). I let them have ten euros each and realised pretty quickly that it would not last long! Never mind, I insisted we walk up and down to see all the stands and rides before making a choice or they would have spent their money within five minutes. In the end they chose the trampoline with harness, and a shooting stand with crossbows (!). What surprised me most was that despite living in that village for five years, I saw no one I knew. I used to recognise and talk to loads at the fair, but last night, I saw one person and he came from where I live now. It just shows how the village has grown in the last five years since I moved. New houses have sprung up on several estates, bringing in lots of new families whose kiddies were having fun at the fair last night. Despite only having ten euros each, the boys were keen to stay and mooch about. We didn't see any of the bull runs, but the bull runners were very much in evidence in their team groups at the extended bar roistering, drinking, and looking modestly satisfied in their bull kit. They were probably partially deaf too, or going that way what with music blaring and people shouting to make themselves heard. We left my eldest to come home with his friends, and headed off into the calm, my youngest delighted at his perfect day of sport, displays of courage, fun, and skill. And he even came home with a pistol after hitting all his targets. What I don't understand is where all these newcomers are working. There is huge unemployment in Montpellier, so just where do these people have a job?! It's the same here houses just pop up like mushrooms, mainly families, I think it must have something to do with famille nombreuse. Glad the boy's had a good time, they still have a a meter to go before they beat my record! What an absolutely fantastic bridge! How funny about not knowing anyone at the fair. I live in New York and although at times it is big and impersonal I am surprised at how often I run into people I know...I suppose because the size of the island compells us all to share space and otherwise interact? Dash- around here it's houses, but in town it's all flats - loads and loads of them. Where are these people working, that's what I want to know? Six metres, Dash? Oooer, that sounds high. I didn't go in for the jumping, but I did slide down with the current at the mini dam. The water was lovely and fresh. I tried to do some exercise by swimming against the current like you do in pools, but it wasn't easy and I kept having to avoid others being carried with force by the water. Laura - it is a super bridge, one of several in the region. It's also terribly narrow, but cars can cross. It's quite an exciting experience! I expect all the people I knew went on another day. My eldest, who used to go to school there, met up with a bunch of his old pals so it's not like everyone's moved away. Typical boys jumping off of things! It sounds like they had lots of fun! I didn't realise Montpellier had that much unemployment. I heard it was the fastest growing city in France or something with more newcomers than anywhere else per year. Maybe all the newcomers are working in the road industry and have helped create the chaos that the one way system in Montpellier has become? Just a thought! What a lovely article, and your site is looking jolyy snazzy ! I do so agrée about all these folks flowing into Montpellier, and houses springing out of the earth quicker than weeds inspite of all the lack of jobs...and I suppose it is a like a french proverbe which commes from an oldie french song "la misere est plus facile au soleil"...hélas! Sorry to have taken so long getting here - for some reason I thought I had already commented, but then my first few weeks settling in did see me fairly confused. Our French town seems the same old characters at the same old things and I have to confess to not really joining in things when we were there. We used to talk about going to things and then on the actual day would just choose to chill at home. I guess with the boys you need to get out and be involved - at least they know all their school mates.